Over the last 6 or more months I have received quite a number of messages about aging Tahr and Chamois, from hunters both young and old. I’m not sure who appointed me an ‘expert’ but I thought I would share what I know, and hopefully this helps people to have a better understanding of the critters they have on their walls and things they see in the mountains. First up I would like to thank Ken Tustin who is arguably the ‘world expert’ on Tahr for reviewing what I have written and assuring it is as true as it can be, and Tim Butcher for many photos. What I have learnt and written below is a combination of homework(reading) and field study(hunting) over the last few years as I have become more obsessed with mountain game. If anyone has some info that I have missed or something you suspect is wrong, please contact me as I would love to learn more about the subject. When it comes to mountain hunting (sheep and goat) around the world, age is often the most discussed topic. How old was that ram? How old was that billy? More so than deer species, age is talked about with sheep and goats mainly because you can actually age animals quite easily compared to deer which require pulled teeth for accurate aging. There are a lot of reasons to focus on shooting older animals such as better trophies and and herd structure as well asleaving them until after they have bred etc. In New Zealand we have a very unique and difficult situation trying to manage introduced animals, currently we have very little in the way of ‘management systems’ for our game. Some game doesn’t need much thought into management but the facts are, we are only getting more and more hunters (and guides), and we sure aren’t making anymore country to hunt on. Tahr and Chamois are both generally seen as ‘trophy’ animals, sure the meat is an import aspect, but due to the terrain these animals live in and the distances from our main urban areas the average hunter is out there looking for a ‘trophy’ maybe once or twice per year. Targeting the oldest males of these species means there will be more young males left to come through as future ‘trophies’. The females are another story and I will touch on that later. Annuli in this sense is referring to a ‘ring’ formed on the horns of animals as their horn growth slows/stops. In mountain game this happens during the winter and every winter a new ‘ring’ will appear. As the spring growth comes through the horn will grow away again. The spaces between each ‘ring’ will progressively get smaller each year until the animal reaches a point where they grow very little. Annuli form on most horned animals, both male and females, and have been used for a long time as an accurate age measure. False ‘rings’ can and do occur, these are where the animal has a short period of slowed/changed growth (such as an injury), these rings are not as well defined as ‘true annuli’. Animals also have ‘crinkles’ and lines on their horns which can confuse things. Tahr horns are usually pretty easy to see the annuli but some Chamois can be quite hard to determine what’s what. What actually causes annuli seems to be a bit of a mystery. I have thought it was ‘winter’ but animals on farms with unlimited feed still have them, some say its hormones of the ‘rut’, yet females have them. Maybe this will always be a mystery but they are formed and it relates to the rut/winter. The best view to see annuli is often from the ‘inside’ (back side) of the horn, as the outer surface can be broomed/damaged and harder to read. True annuli will be a defined line that goes all of the way around the horn, and you will be able to get your fingernail/knife edge into the ‘ring’. One thing to remember is annuli/ ‘rings’ refer to winters, not years. They don’t magically form on the animal’s birth day. So, animals are generally called full or half years depending on the time of year they are shot. Animals shot in the spring/summer will be ‘full years’, eg 9 or 10 and so on. Shot during the rut/winter they will be closer to ‘half years’, eg 9.5 or 10.5 etc. With all species determining the age of the first ‘ring’ is often the hardest, but also the most important. Often the first years growth can be broken/broomed or smooth. Knowing the normal growth pattern of the species you are looking at can help you ‘guess’ where the first line should be or should have been, and then you can go from there. As we know most Tahr are born at the end of November, from then they have about 6 months of growing before their first winter and during this winter the horn growth is slowed. The horns then start growing again in the spring. The first real ‘ring’ is formed the next winter at around 1.5 years (18months) old. From then on, we see the same pattern with around 6-8 months growth and a ‘ring’ formed each winter. Like all horned animals the first couple of years really determine how big the horns will grow. A bull can grow anything from 4”-8” over the first 1.5 years and a bull can never ‘catch up’. (they cannot grow more in their 3rd year than they did in their 2nd year). This is important to remember when looking at ‘false rings’. Determining the first ‘ring’ at 1.5 years is the most important and can often be hard to see. A good indicator is the change in horn type, the lamb tip is smooth and with out a ‘keel’ or ‘ridge’. The first real sign of the ridge forms after 18 months, as can be seen in the below photo. This photo shows the progression of growth from the ‘lamb tip’ top left to a 10.5 year old bull bottom right. Adding chalk to the annuli makes them easier to read. 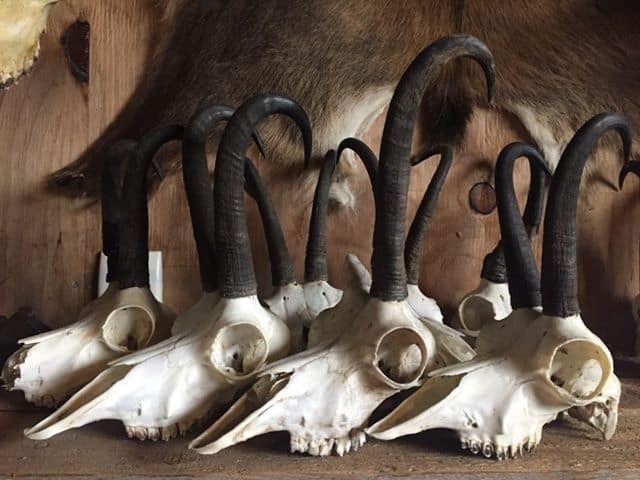 These horns are aged approximately TL to BR: 6 months, 1.5 yr, 2.5 yr, 3.5 yr, 4.5 yr, 5.5 yr, 6yr(shot in spring), 8.5 yr, and 10.5 yr. Once a bull hits maturity at around 7 years old, growth slows down dramatically as can be seen in the tightly packed rings on the two older bulls. All of these horns(plus another 10 odd) bar the bottom 3 were picked up on a 4 day hunt this summer. A ‘trophy’ class bull has historically been a bull over 12” in length. Some people now consider this to have changed to 13”, as we seem to be seeing more and more ‘bigger’ Tahr. Whether they are getting bigger or there are just more Tahr in general is hard to say. Bulls like these will never reach ‘trophy’ class in terms of horn size. But they still will grow very good manes and that is a trophy in it self. All of these bulls are well under 11″, some of this is due to broken tips(top bull), small growth(left) and excessive brooming and wear on ridges and tips(right). We are seeing some true monster Tahr being shot, some pushing 14+” at only 6-7 years, what these bulls would grow into if left to old age is hard to imagine. Passing these bulls up is a very hard decision, especially on public land. But I think it is only a matter of time before we a see a few of these bulls that have escaped hunters and lived to old age and some of them will be pushing well into the 16-17″ class if given the chance. Of note is the current World Record bull(Free range), only 7 years old and is over 15″ long with 10 1/4″ bases(SCI 50 7/8ths). A comparatively ‘young’ bull, 14 inches long and with 9 1/2 inch bases he is a monster. What would he grow into with 7-8 years more growth?? A bull Tahr seems to live for a maximum of around 15-16 years, after around the 8-9 year bracket the horn growth slows dramatically and is only around 1/8 or 2/8ths of an inch per year. Nannies show annuli the same as bulls and tend to live longer and I have heard of a few getting into the 20+ age bracket and seen a few in the mid/late teens. Tim aged this nanny around 14 years old. They are much harder to age than bulls due to the closeness of annuli. Nannies seem to keep breeding into old age, one of the reasons Tahr can be such prolific breeders. Chamois have a very unique horn growth and there is no other animal I know of that can have a 90 degree turn to their horns like the chamois does. Chamois are born a similar time to Tahr and their horn growth follows a similar pattern, but the first ‘ring’ is often impossible to determine. So generally, the first obvious ‘ring’ is generally their 3rd winter or around 2.5 years old. Even this first ring can be very hard to define.Once a chamois hit around 4 years old (5 winters) we see a very rapid decline in horn growth and the ‘rings’ from here on out are tightly packed, this is a good indicator of working out where the 4th and 5th annuli are. Here are two real life examples. The buck on the Left I would say is 11-12 years old and the buck on the right I put at 8-9 years old, these bucks seem to have pretty well defined annuli for NZ Chamois. Some Chamois do not seem to have any real definable ‘rings’ and most of these animals I have seen personally are from the west coast. I believe these animals are spending winters at low altitudes and no do not have a major halt to their horn growth. Or they are just too young to show the tightly packed growth rings. Horn rot also adds to the problem of aging Chamois and a lot of these animals are impossible to age with severe damage to the lower horns. Horn rot is very prevalent in some core west coast areas, this buck I had aged with a pulled tooth at around 5 years BUT the guy who aged it said due to the size of the teeth chamois are hard to age. Either way hes not getting any older and was not going to grow his horns back. Whether you shoot these animals or not is often discussed, I think if they have a good skin or you need the meat shoot away. Although horn rot is not a ‘genetic’ condition it will have an underlying genetic susceptibility and shooting all the animals WITH horns and leaving the ones without (which happens in some areas)will not help the problem. Chamois tend to live longer than Tahr and it is not uncommon to see animals in their teens from what I hear in Europe. Aging Chamois in NZ from Annuli is very difficult in some cases, and reportedly not very accurate, why our chamois are different to their European cousins is hard to say. From what I have seen personally some Chamois here seem to have very well define ‘rings’ and are easily aged(seemingly) and other chamois have no definable ‘rings’ are therefore impossible to age by this method. So maybe aging chamois from Annuli in NZ is a complete waste of time, I dont know. But my theory is that animals from above the bush line have good defined annuli(generally) and those bush dwelling are more hard to read, maybe due more availability of feed over winter and brooming/rubbing of horns on scrub and horns being wet all the time. Add to this the fact Chamois do not show much of their annuli until they 4-5+ years old leads me to believe alot of animals that are shot are just younger than we think. This all depends on who you talk to, and at the end of the day once an animal is shot it won’t get any older or younger. Finding older animals generally shows more patience from the hunter to look over a lot of animals, and allows the next generation to ‘grow up’. In terms of a ‘better trophy’ it depends who you talk to and what they personally believe. For Tahr I do think age makes a ‘better’ trophy. Nearly all of the people I have hunted Tahr with, both domestic and foreign are not that worried about inches, after all its only 1-2” between an average and monster one (Tahr we are talking about). The one thing all Tahr hunters I know are looking for is a ‘good skin’. A bull Tahr reaches full maturity at around 7 years old, no younger. His body size and skin size are markedly bigger than a 4-5-year-old. Once a bull is around 7-8 there does not seem to be much change in the skin size/quality. So, in terms of a ‘better’ trophy I do think a 7-year-old bull is that much ‘better’ than a 5-year-old. And if we all focus on shooting older bulls, there will be MORE older bulls. It may seem a little backward but the more older bulls we shoot the more will be coming through to reach 8+ years, and therefore more ‘trophies’. If everyone only shoot old bulls finding a 10 year old would not be all that hard. Good things take time, this bull is a perfect example of how age can add to a ‘trophy’. As a 6 year old this bull was an ‘average’ 12 inches, over the next 6 years he grew out to just touch 14″. Tahr only grow a small amount once they hit maturity but it does add up over time. I try and put bulls into 4 categories when I am on the hill, juvenile 0-2 years, immature 3-5 years, mature 6-8 years and ‘old’ 8-10++. The first two categories are not worth much time (my opinion) and you are far better off to spend that time looking for bulls in the last two categories. To age a bull off annuli you need to be within 300-350 yards, have good light and a good spotting scope. All these things are not practically possible in Tahr country so it is far better to age bulls off their body/cape size/markings and behaviour. This is a topic worthy of its own article and I am working on one, when I have sufficient photos. Nannies are a completely different ball game to bulls and we should be taking the opposite approach to shooting them. We have a finite number of Tahr in this country and we are obliged to do our bit to balance the herd. Most of us see Tahr as a ‘trophy’ animal, and in that sense, we want a high bull to nanny ratio. If you have an itchy trigger finger let loose on some nannies. A lot of areas are holding too many Tahr and DoC will be cranking up some more gunships in the near future I think (based on the current Govt and numbers of Tahr). Nannies are far better eating than Bulls and there is no real reason to bomb up a mob of young bulls. Chamois are different, and there is very little difference between a 10-year-old buck and a 5-year-old buck on the hoof (to my eyes). A lot of us shoot ‘old’ nannies/doe’s and this is quite common in Europe as well. Ageing Chamois on the hoof is incredibly difficult and you can often only put them into 2 categories, juvenile and ‘mature’. Even then these can vary hugely and things like horn rot can really throw you off. From what I have seen over the last few years is that in a lot of areas the Chamois numbers seem to be declining. I think a lot of this is over harvesting of breeding does/nannies (mainly by guides) and an increase of Tahr in some core chamois areas. In Europe shooting old doe’s comes with some ‘respect’, but we should not compare ourselves with Europe too much. All Chamois populations I know of in Europe are very strictly managed and the keepers/guides have very good knowledge of which animals to shoot to keep the herd stable. Here we have no such system and it is very easy to over harvest (or under harvest in the case of Tahr) the breeding population. Chamois are a low-density animal throughout most of their range and do not have the detrimental impacts that Tahr can have on the environment. I think a more careful approach to ‘managing’ Chamois into the future is needed if we are to see them stay throughout their current range in good hunt-able numbers. ‘Game Management’ is something kiwis are not known for and it is not a part of our hunting culture. In the past there has always been ‘over the next ridge’ or an untouched valley with more game. As our technology and hunter and guide numbers increase there are less and less places for game animals to hide. AATH/Heli hunting is a perfect example of areas which have acted as population reserves are now receiving higher hunting pressure. The commercial sector has the most to be careful of I think, and we would be wise not to shoot our selves in the foot by over harvesting some species and under harvesting others. Its all about trying to reach a balance where everybody is happy. We only need to look at the past to see what can happen when the commercial sector gets greedy. Hopefully this make sense and makes you look at your ‘trophies’ a little differently.